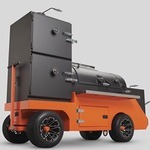 Yoder Smokers Community Forum • View topic - Difference in cooking on top vs bottom rack? Difference in cooking on top vs bottom rack? Hello, I can't seem to find the answer I am looking for on google or this form. I watch a lot of atbbq on youtube and can't figure out why he smokes the majority of his meats on the top rack vs the bottom rack. I get that there is going to be a temp difference between the racks but is there any particular reason why I should use the top rack as the main cooking grate vs the bottom? I also understand that you can designate which rack to cook which meat on depending on if you want it to cook faster on the main bottom grate. I guess a simple way of asking is, why do I see most people smoking meat on the top shelf when you have the bottom "main" grate for cooking. 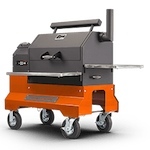 Re: Difference in cooking on top vs bottom rack? I have sent a message to Chef Tom asking him to comment as well. Yoder_Herb wrote: I have sent a message to Chef Tom asking him to comment as well. Awesome, keep me updated on what he says. I'll use both as well, especially when smoking meats at lower temps. However, I can be impatient and choose to cook hotter, especially after wrapping. In that case, I'll move the meat to the second shelf to create distance between the meat and the diffuser, which puts off radiant heat that's more intense when cooking at higher temps. This prevents the possibility of scorching the bottom of the meat, especially if you have something with some sugar content in the wrap, like bbq rub. The reason I often use the second shelf in videos, regardless of cooking temp, is because it's just easier to display what's being cooked and therefore visually more appealing for the sake of the video. 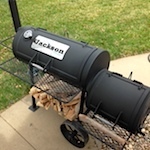 ATBBQ_Tom wrote: I'll use both as well, especially when smoking meats at lower temps. However, I can be impatient and choose to cook hotter, especially after wrapping. In that case, I'll move the meat to the second shelf to create distance between the meat and the diffuser, which puts off radiant heat that's more intense when cooking at higher temps. This prevents the possibility of scorching the bottom of the meat, especially if you have something with some sugar content in the wrap, like bbq rub. Thank you so much for the response. I have been following your channel for about 6 months now and have watched every video you have put out. Your team has helped me learn so much about cooking. Thank you for taking the time and effort to respond to this post, it means more than you know. The quality of your videos is top notch, never stop. Thanks Tom, and thanks Herb for helping me out as well.